Once a year, Education students at Northwestern University, in Minnesota, get the opportunity to make a huge mess and learn a lot about making teaching exciting along the way. Spangler Science Ambassador, Lisa Schoneman normally teaches Kindergarten at Halverson Elementary in Albert Lea, Minnesota… but once a year she packs up her science tricks and heads to Northwestern to give pre-service teachers a chance to learn how to be amazing. “The teachers get really excited about learning and usually bring what they learn from the workshop into the classroom and share the ideas with their cooperative teachers, where they are completing their field hours,” says Schoneman about her workshops. This year, the university students learned about everything from color mixing to that infamous Mentos and Diet Coke Geyser. And, yes, they made a huge mess… but had a lot of fun… in the process. 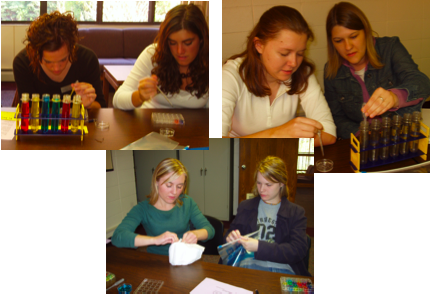 The Spangler Science Ambassador Program started in 2004… with a group of highly talented elementary teachers from all parts of the country. The common thread that tied them all together was their stellar performance at the National Hands-on Science Institute (most of the teachers have attended several of the week-long workshops like Science in the Rockies offered since the Institute’s inception in 1991). Originally, I set out with a goal to create opportunities for each of the Ambassadors to share with other teachers their own best practices and classroom strategies for getting kids excited about science. I felt that each of these Ambassadors had something special to share, and presenting at a local, regional or even national education conference was the perfect forum. The core competencies and presentation techniques taught at Science in the Rockies serve as the basic foundation of each presentation, but the hands-on science lessons come directly from each Ambassador’s classroom. Lisa Schoneman continues to receive great reviews from teacher audiences who attend her science training workshops. Lisa does a great job of using the scientific method to teach her children how to think and act like a scientist. In the pictures above and below, Lisa introduces teachers to lessons from her classroom using polymers, giant air bags and a make-and-take activity based on Grow Creatures.The Spangler Science Ambassador Program continues to be a great way to introduce the greatest number of teachers possible to our core principles and teaching philosophies for getting students engaged in the process of doing real science. So, if you’re attending a conference and you see a Spangler Science Ambassador listed on the program, rush to get a front row seat. You won’t be disappointed. You raise the “5-HT” levels of the Ambassador Team off the charts!!! What a great article. This one really hit home from me as I am originally from Austin, MN. Its a great feeling to know that we have a teacher like Lisa in our area helping new teachers to be great that could end up teaching our kids!